Remember the Dollar Store Treasure Hunt challenge from a couple weeks ago? I want to share this dollar store find! I didn’t go to a dollar store last week but I do pop into them occasionally and always have a fun time. About a year ago, I found this awesome little gag and I love friendly gags! I keep it in my learning studio and kids and parents alike love it! 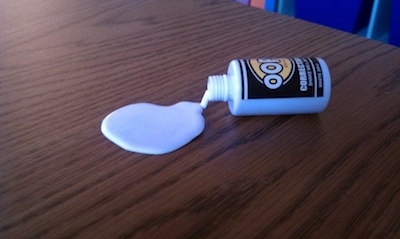 As you can see from the photo it is a fake bottle of spilled white out. The label on the bottle says “OOPS” as the brand name! This tiny little $1 item does more to lighten the mood in my office than any expensive sound machine or waterfall could! I love my Dollar Store find! This challenge came from the March 13 Juicy Tips For Miraculous Living newsletter. Each week I give you a special idea that will hopefully bring a little extra joy into your life. I encourage you to send in photos and stories from the adventures these tips lead you on. Want to send one of yours in? Just reply to the newsletter or use the “Contact” tab above! If you’re not receiving the newsletter yet, you can sign up in the box in the left column. Thanks for finding me, Olivia, and I look forward to reading more at your site.